East Halmahera is in a region isolated from most media and outside information sources, making it difficult for parents to educate themselves about what’s best for their children. As a result, child well-being is not well understood or prioritized. 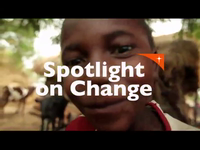 In fact, many in the community believe that children should contribute, working as miners or stone breakers or missing school to watch their younger siblings. Some children are left home for days at a time while their parents are at work. Children also lack opportunities and spaces to express themselves and their dreams. They’re not encouraged to speak up or participate in conversations that affect them and don’t have clubs or groups where they can come together. Unfortunately, programs dedicated to supporting the healthy physical, emotional and spiritual development of children are non-existent in East Halmahera. Other issues that threaten the well-being of children include poor nutrition and instances of violence or abuse.